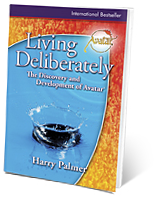 Perspective spoke with Harry Palmer about the nature of beliefs and The Avatar® Course. Perspective is an electronic publication available in the publication archives at TheAvatarCourse.com. Perspective: I suspect the question you are asked most often is: What is Avatar? So, what is Avatar? Harry: Avatar is about every reality that is, was, or will be. I know that's not very descriptive, but it is the truest statement I can make. Avatar deals with creation, which I define as anything that has definition or limits in space, time, or awareness. That covers the universe and everything in it. Since most people are not really ready to engage Avatar at such an all-encompassing level, I usually talk about beliefs. People have an instinctive recognition that what they believe has a consequence in their lives. The principle dilemma of existence is what to believe. That's the philosophic abyss that confronts everyone. That's the abyss called, "I don't know." It's dangerous not to know. At the edge of this abyss are the shops of the belief peddlers. Some shops are lavish and hallowed with histories. Some are Volkswagen buses driven by cult recruiters. Everybody is selling a belief program and a one-way ticket to the land of truth on the other side of the I-don't-know abyss. 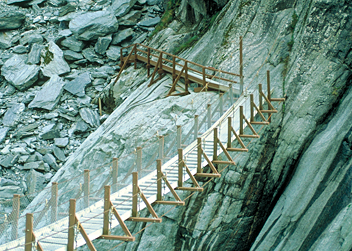 There are thousands of rickety belief bridges across the abyss, and each one leads to a slightly different experience. What is different about Avatar is that the belief program is blank, the bridge is rock solid, and the ticket is round trip! There are thousands of rickety belief bridges across the abyss, and each one leads to a slightly different experience. Harry: That's good, and there's no fuss about returning it. People pretty much experience what they believe—even though sometimes they don't believe they believe it. Perspective: Are you saying that we don't always know what we believe or experience what we say we believe? Harry: That's right. And that is the flaw in positive thinking. You can stick signs on every mirror in the house saying, "I'm happy to be me," and chant it for a half hour before every meal and still not experience it. The reason it won't take you across the I-don't-know-abyss into a real experience is because you are already across experiencing something else. Maybe you came on the ticket, "Nothing really makes me happy." That is the real belief that is underlying and motivating all of the positive assertions. Harry: The easiest way is to work backward from what you're experiencing. If you are experiencing unhappiness, you can be pretty certain that your leap of faith across the abyss was on a belief that you were going to be unhappy. When you find your real belief, you can use the Avatar techniques to change it. When you do, what you are experiencing will change. Until you find the real belief, you believe over, and what you are experiencing is only superficially affected. Perspective: That's a good point. I have seen a lot of people do a workshop or a seminar and add a new coat of belief to their lives. It doesn't really affect the way they feel for very long. That brings me to another question. What is the difference between belief and truth? There is usually some agreement in regard to empirical events. For instance, a tree falls. No question in anyone's mind. The tree was standing and now it's toppled over. We can measure where it fell, how strong the trunk wood was, how old it was, etc. No one has to take any of this on belief. You can go and kick the tree. It's a certain truth; the tree has fallen. But now ask, "Why did the tree fall?" Now what to believe confronts us. And someone says, "Oh, sure, and why didn't every tree fall? Why did the wind reach 36.5 miles per hour?" And you say, "Okay, and why did that happen?" Until you find the real belief, you believe over, and what you are experiencing is only superficially affected. If you happen to feel a little perverse, just keep pushing for a more fundamental why, and eventually you will reach our I-don't-know abyss. It is at this I don't know that the whole concatenation of beliefs begins as to why the tree toppled over. As long as we make the concatenation so long that no one runs off into the abyss, we have a "scientific" explanation for why trees topple over. Harry: Honest answer? I don't know. But you see, not knowing is dangerous. Fear arises. Fear motivates maybe-explanations. So let's say I pushed the tree over so I could make a point. I did it deliberately. 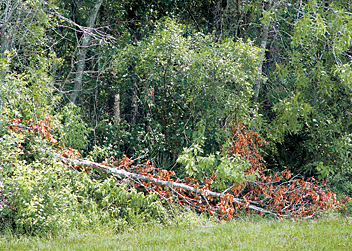 Harry: The point is that around this singular event of a tree falling over, a whole belief-generated reality can develop—a reality with winds, and stress factors, and solar thermals, etc. When enough people accept these beliefs, we'll have someone selling us tree braces. Of course, there are equally plausible alternate explanations, for instance, soil moisture and root rot. The interesting thing is that the people experiencing the soil moisture/root rot reality can easily see that the reality of the wind/stress factor people is a belief system. They're not always so discerning about their own reality. Down deep inside of us is this sad little guy who clearly sees that everybody else's reality is based on belief. He's trapped in his own belief about truth. He's backing away from the abyss and explaining as fast as he can. When he permits himself to see his own beliefs as beliefs, he will discover real wisdom. Perspective: That is an insightful metaphor. I guess my next question is why would I want—to use your word—to discreate my beliefs? Harry: You don't have to. It's not the intention of Avatar to destroy your reality or change what you believe. Avatar is only about making the connection between your beliefs and experiences. Avatar's message to people is that they can be source of their reality. They may conclude their association with one reality and move on to another. We are seldom, if ever, locked into a reality that we can't change simply by deciding to change our beliefs. Perspective: So in Avatar it's up to the person to decide whether or not to change? You don't have to complete every problem in an arithmetic book before you move on to algebra. There comes a point when you get it. These numbers and these functions produce these results. Got it! Time to move on. Harry: Yes. And so is algebra. So is every reality when viewed externally. But that doesn't mean you can't submerge yourself in a reality and learn the foundational beliefs and play the reality to your heart's delight. Just don't get so stuck that for the rest of your life all you do are arithmetic problems. Perspective: I can't help thinking of the expression "one-trick pony." Harry: Exactly! The purpose of using Avatar is so that your life doesn't turn into a one-trick-pony life. Perspective: I think we all can relate to the idea that at some point we've learned what we need to know from certain problems and events in our lives, and there comes a time to move on. Why Avatar? Harry: Are you asking me to create a belief system? Okay. Let's believe that creating and experiencing reality is only one of many potentials possessed by life. And let's believe that when we conclude our exploration of these realities, we awaken to new potentials. Perspective: That's interesting. Are you suggesting that the reason for Avatar's appearance at this time is because a lot of us are ready to move on? Harry: Yes. I think a lot of people are ready to assume responsibility for their own, as well as for civilization's, deliberate evolution. 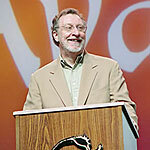 As life evolves it becomes more integrative, and beliefs are less defined. The opposite direction, where life becomes more separate, beliefs become more solid and defined, is decay. Evolution and decay should not be confused. Perspective: Something else occurred to me while we were talking, maybe it's just a belief. I mean of course it's a belief. How do we go on talking? It's all belief, right? I just got that! Harry: No problem. Let's just entertain each other and believe we're discovering truth. Perspective: Okay, I'm willing to believe that—I'll deliberately believe that! Oh, I just understood the title of your book! Anyway, where was I? Oh, what occurs to me is that the beliefs that are supported by the body's senses are more solid and real but then seem to fade in certainty toward the edges of our sensory envelope. Is that right? Are we pushing the envelope of our own reality? There is an old story about a farmer who places a budding pumpkin in a jug. As the pumpkin grows, it fills the jug and can't grow any larger. The jug is the belief limit of what we can experience. When the jug is broken our reality expands. From the inside, every reality appears to be infinite, every belief to be the truth. Perspective: Okay, then I've got another question. If your reality just keeps growing, how do you ever get out of it to create a new reality? How do you get back across the abyss? Aren't you just adding to and changing the reality every time you break the belief jug? Harry: You are right. There really isn't an exit out there at the limit of a reality-bubble. From the inside, every reality appears to be infinite, every belief appears to be the truth. The return ticket in this infinite belief-to-reality is located exactly right where you are, and it is validated by fully experiencing yourself as source of the creation. Now, I'm not talking about blame. I'm talking about power and ability. As source of the belief-to-reality, you can turn it on and off. When it's on, it's infinite. When it's off, you're enlightened. Thinking, figuring, and believing are tools for exploring within a reality. They won't turn it off. Only experiencing a belief-to-reality fully will turn it off. Perspective: Is it really possible to experience a reality fully? Harry: Yes it is, but it is an ability that needs to be understood and developed. Many people have experiencing confused with explaining. Some people mistake experiencing for thinking or remembering. Everything gets categorized rather than experienced. Some people have experiencing confused with believing or imagining, some with suffering—experiencing is a very misunderstood concept. Harry: It's actually a more fundamental phenomenon than language or understanding. It has more to do with being present and feeling than with intellectual understanding.